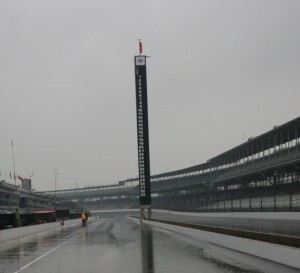 Meanwhile, Indy 500 rookie Alex Tagliani and Conquest Racing made the best of the soggy situation by opening up their Gasoline Alley garage to disappointed fans. Philippe completed the final phase of the four-step ROP process in the first 35 minutes of practice. Less than 15 minutes later, rain halted all on-track activity. Philippe completed 18 laps, topped by a tour around the 2.5-mile track of 41.3436 seconds/217.688 mph. Rookie Stanton Barrett and Alex Lloyd, who finished 25th at IMS as a rookie last year, were the only other drivers to turn laps, combining for 16 before the rains came. Lloyd, fastest rookie on-track in last year’s race, is driving the No. 99 HER Energy Dallara/Honda fielded in a partnership between Sam Schmidt Motorsports and Chip Ganassi Racing. With the final scheduled ROP session cut short, Thursday’s schedule has been expanded to begin at 9:30 a.m. instead of noon. Barrett, the final rookie with two more phases of ROP to pass, will have one hour of track time before the Speedway opens for all cars at 10:30 a.m.
“I’ve been here in the (Sprint) Cup car, but everywhere you go the Indy cars are a completely different experience,” said Barrett, driver of the No. 98 CURB/Agajanian/Team 3G Racing Dallara/Honda. “It’s pretty dang exciting, as well. It’s a cool place to get around in an Indy car. We’ve only had 30 minutes (of track time) except for this morning. The car is better today than yesterday. It’s comfortable, and I’m really paying attention to my line and the entry and timing. We don’t want to take too big of a bite out of any step of the process. That’s really important for us – that we can’t make mistakes right now and keep the goal and long term in mind. Tagliani and Conquest Racing thoroughly endeared themselves to curious fans by opening their garage doors. Several fans had a chance to climb into the No. 34 Conquest Racing entry, and Tagliani even let one woman try on his firesuit. “Before coming here, I was told that it wouldn’t be Indy without rain. I guess that is true, especially with more rain forecasted for the next few days,” said Tagliani, a native of Quebec, who made two points-paying starts for Conquest Racing last season.